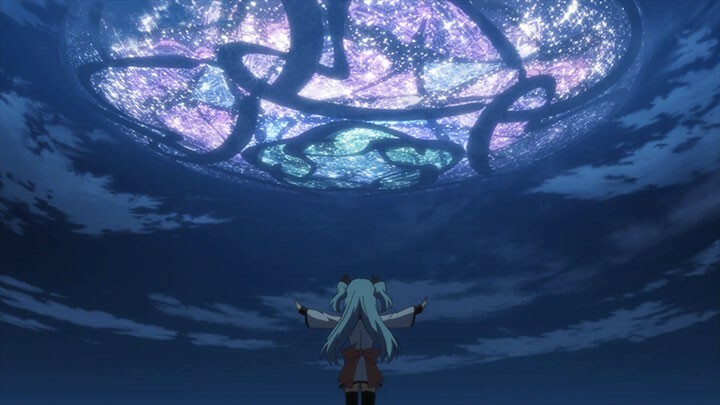 I had no expectations of what Sora no Method (Celestial Method) was or would become, but was curious about its looming mystery. This mystery hangs in the air literally over Lake Kiriya, in the form of a sparkly saucer. It’s clear early on that the saucer doesn’t have Independence Day intentions, but still, no evidence of any aliens disembarking? Or is there? Why is it here? This in itself made it an uncommon premise to the usual apocalyptic invasion. 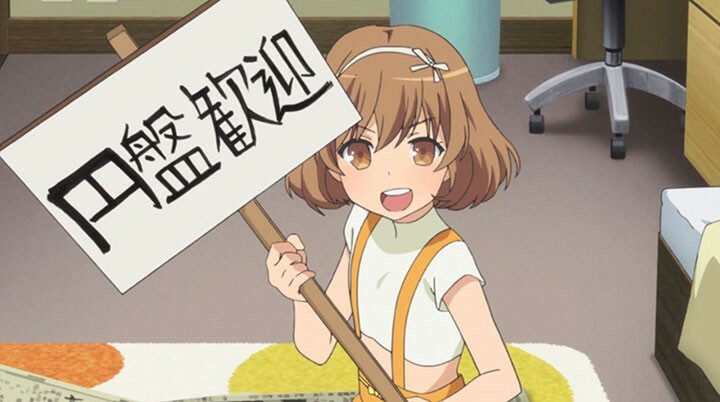 In addition, the anime’s opening could almost make you mistake it for being in the magical girl genre, but it’s more slice of life with a strong focus on relationships and character development. Unfortunately, the series doesn’t live up to its potential. Sora no Method feeds tiny breadcrumbs to its audience and does so sparingly, making the story rather thin across its 13 episodes. Sora no Method begins with Nonoka and her father moving to Lake Kiriya City. It turns out that the town’s main tourist attraction — the saucer — has been in the sky above since seven years ago. Coincidently at the same time, Nonoka and her father had originally moved away from the town. Soon after moving back to Lake Kiriya City, Nonoka comes across a little blue-haired girl, Noel, who claims to know her. Nonoka has no memory of Noel and accuses her of breaking a photo frame containing a photo of her deceased mother. It turns out her father broke it, which triggers Nonoka’s memory of Noel as she searches for her to apologize. 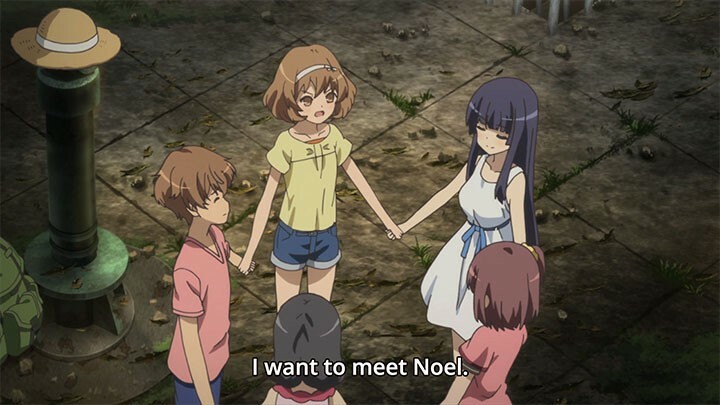 Noel, happy that Nonoka remembers her, informs her that she will grant her wishes now as she promised, seven years ago. In the episodes that follow, Nonoka starts at her new school, meeting the other main characters — Shione, Koharu, Yuzuki and Souta. 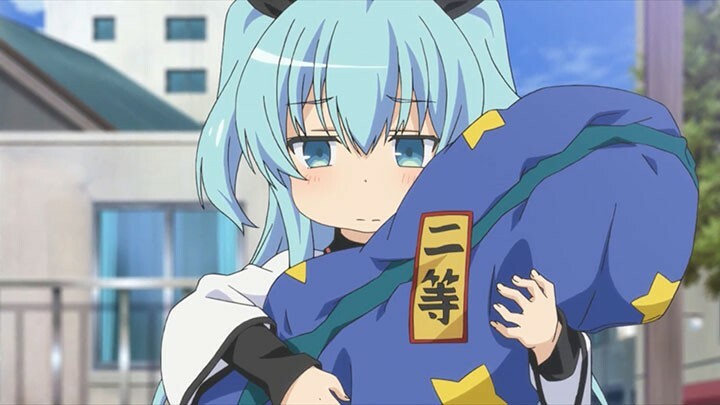 Shione is completely cold towards Nonoka and gives no reason for her behavior. Yuzuki hates the saucer and often does solo protests to get rid of it, also roping in Nonoka to help out. Koharu’s family runs a tourism store based on the saucer, so Koharu bears no ill will towards it. Souta (Yuzuki’s brother) is somewhat neutral about the whole matter, and would like to see his sister calm down over it. 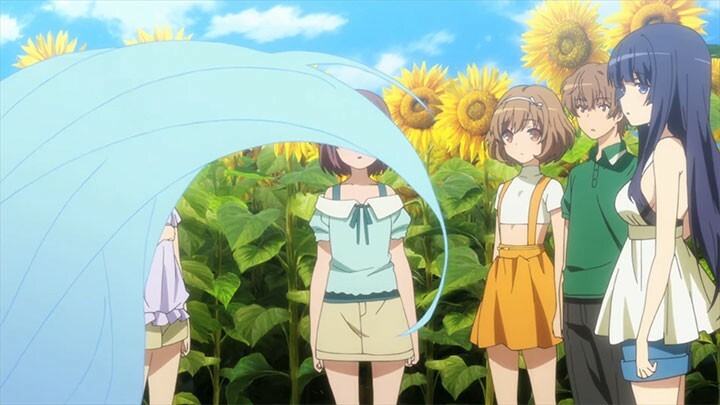 Sora no Method’s attempt to build mystique falls flat and leaves you confused. Characters are introduced well in terms of their personality and their views on the saucer. However, when reaching our first big turning point in the third episode, explanations are vague. Memories come flooding back supposedly, but this isn’t depicted well. The flashbacks are incredibly brief and I felt as though something was lost in translation — the characters were talking about things that weren’t even remotely related to the past that was shown. It turns out they were all friends (you guessed it) seven years ago, and Shione has some kind of misgiving with Nonoka. Somehow the saucer is Nonoka’s fault and it’s not made clear why. I would suggest that this is the anime’s attempt to build mystique around the subject; unfortunately the execution falls flat and leaves you confused. These episodes are mostly mini-stories that deviate from the main story arc and focus on the character development of the main cast. After their memories are uncovered, Yuzuki has taken a strong disliking to Nonoka to the point of physical abuse, with Shione doing the same. Along with this treatment, you end up feeling sorry for Nonoka as she struggles with her blocked childhood memories, from the time when her mother died. Her mother had suffered an undisclosed terminal illness and it’s part of the reason why Nonoka and her dad made the move to Tokyo. 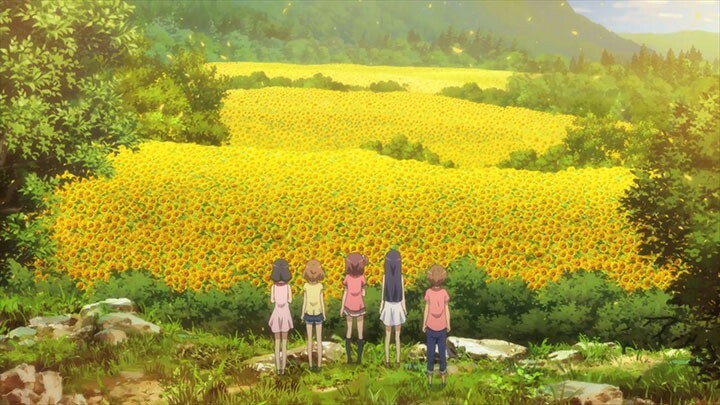 In her childhood memories, despite her tragic family situation, Nonoka is seen as the cheerful girl who glues the friend circle together and befriends the otherwise soft-spoken Shione. This makes you begin to wonder if the negativity aimed at her is valid. Even so, Nonoka feels horrible for not remembering her past, and it’s on that emotion she acts upon to try to set things right. Nonoka eventually finds out from Souta that Yuzuki’s anti-saucer sentiment roots from the continued cancellation of fireworks over the lake. In a flashback, we finally understand Yuzuki’s hate for the saucer, as it took anyway something she loved to see during her childhood — fireworks over the lake at festival time. Knowing this, Nonoka becomes determined to put on fireworks to make up with Yuzuki with Noel’s help. Noel uses the saucer to project fireworks upon it. At this point, it’s clear that Noel has a connection to the saucer and to be completely frank, I already knew that from the very first episode! She says on multiple occasions to Nonoka and later to Shione, “I am the saucer!”. Noel’s statements of relation to the saucer are said right to their faces. Tragically, all of them are too oblivious to the obvious. This drove me insane! Were they even listening to Noel? There is no explanation for the characters’ earlier ignorance of Noel’s statements, nor is there any explanation for their finally taking notice now. This became annoying and my interest waned from here on. As for Noel, episode six is one of the few moments where we see her powers and, like most of these moments, it’s underwhelming. She rigs a raffle draw to win the prize she wants and even then, she doesn’t win it! To be fair, she rigged the draw for herself and not to grant anyone’s wish, which is what her magic is intended for. The previous fireworks effect on the saucer was at least magical, but this raffle scene is a stark contrast of disappointment, making her powers hit-or-miss. If she really is meant to be magical, there should be consistency in her capabilities. It ruins believability in the character and the mysterious saucer she represents. ​By the end of these events, Yuzuki and Nonoka make amends. Nonoka then finds out through Noel about a promise that she made to Shione long ago. Through this we see flashbacks from Shione’s childhood and can understand where her cold shoulder has come from — Nonoka moving away and breaking this promise. It’s clear that Shione doesn’t know how to let go and move on. Nonoka had no choice in moving away because she was just a kid! It’s her parents’ choice. She can’t be blamed for not being able to keep her promise. From that, I felt Shione was rather immature for holding such a grudge. The highlight here is clarification on what actually happened seven years ago. We get the full details on the real backstory and Noel’s claim to grant wishes. Honestly, what gets my goat is I wouldn’t blame Nonoka for the saucer’s appearance. Without giving away too much, she cannot be held solely responsible for it and it isn’t her idea in the first place. With this revelation, you feel little love for the other characters that are supposedly Nonoka and Noel’s best friends. Nonoka is the only character one can empathize with. She’s an all-around fun, good-natured girl, who’s slapped by two girls that she’s meant to be friends with and is blamed by everyone for the saucer. Yet she cares greatly for them and wants to make amends for things that are simply not her fault. My advice to her — drop them all and find new friends. In these episodes, ​some revelations about Noel finally establish her character far better — but it’s left to much too late in the series. Just as unfortunate, there’s still little evidence of her powers. Frankly, Nonoka has done more to grant wishes by trying to make the others happy with her. Noel is more the glue that holds the group together; it’s her childish innocence and her bliss in learning the ways of the world that keep everyone involved. The series picks up the pace a bit in its finale and resolution, though I’m not entirely pleased with the outcome. ​The whole friendship circle constantly debates on everyone’s feelings towards one another. What’s irritating is they’ve all covered these points and problems a number of times previously. I mean seriously, broken record much? This starts to come to an end, thankfully, as we reach the closing chapters. ​The focus instead is on Noel for a change. Aware that they are about to lose her, they discuss how to keep her. This goes to the extreme of sacrificing their friendships as a means of allowing Noel to stay. This act is completely contradictive to the wishes Noel is meant to have granted. Again, this makes me call Noel’s magic into question as well as the group’s intelligence. There’s a far better and easier answer to this problem, but it’s like the writers were trying to fill time before getting to the finale. Ultimately, the ending is obvious and unsatisfactory. Yes, there’s a big magical moment finally, ​but it’s an old trick and doesn’t save the poor writing and the mystery’s thin quality. It’s a pale imitation of happy Ghibli style endings. There’s a lot of waiting around for that final scene and the final episode is ​more of a pointless series’ highlight reel. It was more of a recap episode with characters discussing their resolutions with one another and how they hope to get Noel back. This in turn makes the happy ending hollow and rather short. Which is a real shame, as the animation and special effects are beautiful and well-sequenced. Sora no Method had a different premise that intrigued me, but I was disappointed to say the least. There was little mystery. Noel’s origin was obvious, and the saucer was obviously not malevolent; all you had to do was look at its sparkly shape with flower, star, and heart designs on it. There could also have been better build up to the climax. The story unravels itself and falls apart to be really nothing more than a story of a girl surrounded by the wrong friends, doing everything she can to make them like her. Though the characters do become better as the series progresses, it’s still not the best message to put out there. Nonoka proves that you don’t need magic — if you could call what Noel does that — or a close encounter to make dreams come true. 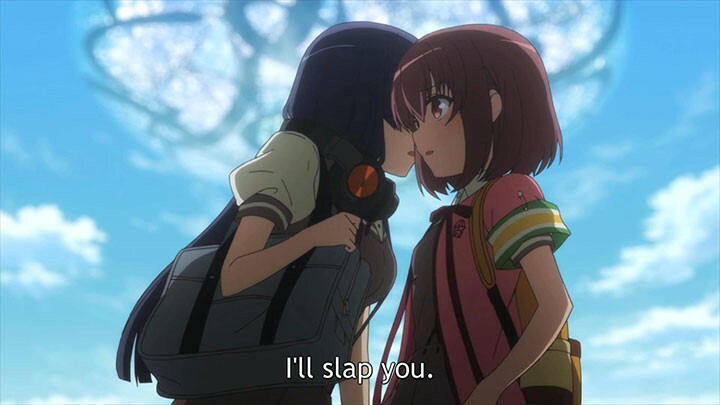 Perhaps that is the lesson I should take from this anime, and gladly will. I’m sorry to say Sora no Method won’t be getting a rewatch anytime soon, or even in seven years’ time. The method was there, it just didn’t have the right follow-through. I watched this before I watched AnoHana, but after I watched AnoHana, I realized that they were basically the same exact show. Thought that was kind of interesting.